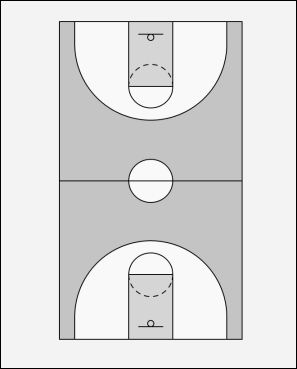 Align the players around court in these positions to start. You can use 12 or more players and need at least 5 balls. 1 starts Boomer with a pass to either 2 or 3. 1, 2 & 3 run the lanes passing back & forth between them. Players 4 & 5 are on the sideline ready to pass to 2 & 3 after they swing the wings under the basket. When 1 gets the pass back at the 3pt line he goes onto make a lay-up. 2 & 3 now swing the wings. 2 receives a pass from 5. 3 receives a pass from 4. 2 & 3 Catch and square up to basket and make a jump shot. 1 rebounds his layup and starts back down the floor with players 4 & 5 in the same passing action as before to the other basket. 2 & 3 rebound (and run to the 3pt line make a 3pt shot, rebound) and pass to players 6 & 7 on the sideline. 4 & 5 now swing to the wings and receive passes from 8 & 9. Next player under the basket gets the rebound from the lay-up by and continues up and down the court with players 8 and 9. Players 1,4 and 5 change lines after their shots. Good for passing and receiving on the run. Catch and Square Up (CSU) for perimeter shooting.